Can powerful, pure unadulterated metal really fit in your pocket? Consider the size of your SUV's keys. 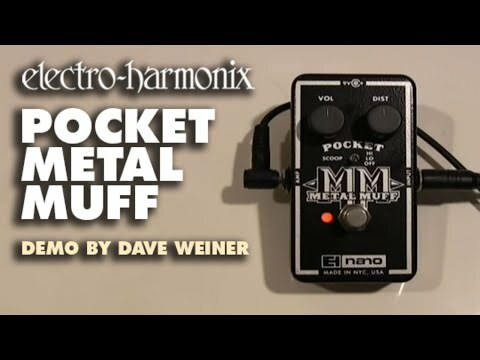 The Electro-Harmonix Nano Pocket Metal Muff Distortion Pedal takes the most powerful features from the popular Metal Muff guitar effects pedal and artfully squeezes them into a slick, die-cast aluminum housing. The Electro Harmonix Nano Pocket Metal Muff Guitar Effects Pedal is the perfect travel companion who is serious about their hard rock and metal. This compact pedal is fitted with two simple controls for Volume and Distortion for you to experiment with dialling in your ideal metal tone. An interesting feature of the pedal is the addition of a three-way toggle switch to control the all-important midrange scoop. Flick between Off, Lo and Hi using the toggle switch to cut the midrange frequencies to your suitability. The pedal can be played through any desired amplifier, making it really versatile. The pedal has a true bypass footswitch to engage and disengage the Pocket Metal Muff, plus a convenient red LED status indicator. To power the pedal, it comes with a 9V battery or can be powered by an optional 96DC-200BI power supply (not included). Electro Harmonix have built this pedal to be small enough to travel anywhere but its die-cast aluminium construction ensures it can also withstand plenty of use. Available at a truly affordable price, the Electro Harmonix Nano Pocket Metal Muff is a superb pedal to accompany you out on the road.